Room 868, still in the Tri-Cell Zone, was filled with interesting products. Opera speakers from Italy have long been a favorite because of their visual design and use of wood and leather. The Callas on the left is more glitzy, while the Seconda beside it is more reserved with a flatter finish on the wood and greater use of leather. It also looked a lot more contemporary. 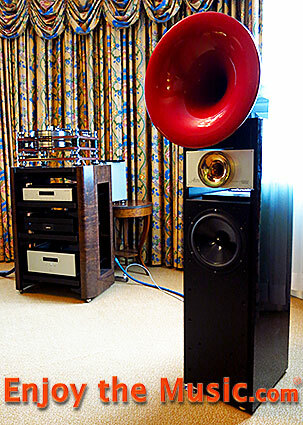 I heard the Seconda speakers driven by Unico electronics (?) playing some music to which I just couldn't relate. 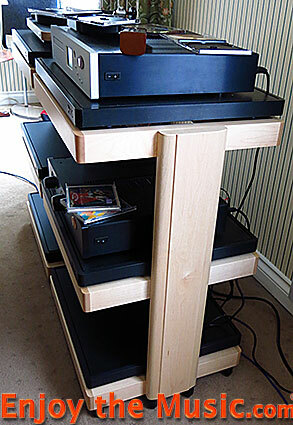 Also of note were the handsome wood stands shown here with HRS platforms on the shelves. A new Clearaudio Concept turntable with a plinth of panzerwood was elegant in its simplicity and sufficiently retro to play 78 as well as 33.3 and 45 rpm. 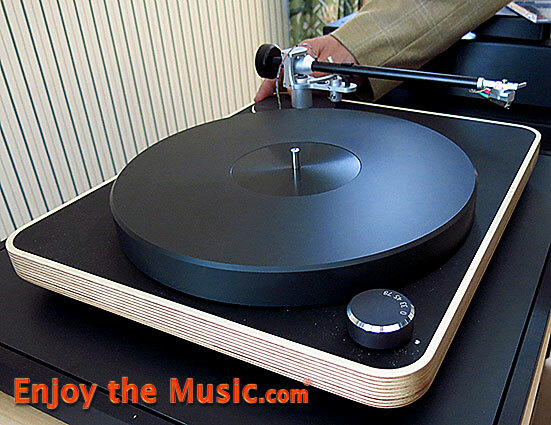 It comes with tonearm and a Concept moving magnet cartridge as a plug-n-play package for $1595. It had been released just two weeks ago. Very handsome. On yet another wall was a table with headphones and their dedicated amplifiers. 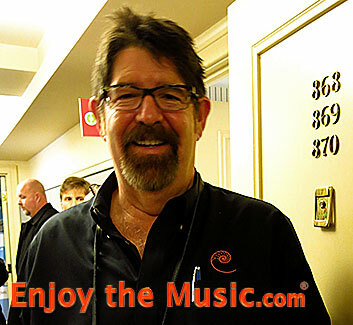 As there was no large "headphone zone" at this show, they appeared in a variety of places including vendors' rooms as well as tables in the large rooms with open booths, and in one instance there was a table set up in the hallway with a several headphone rigs to audition. 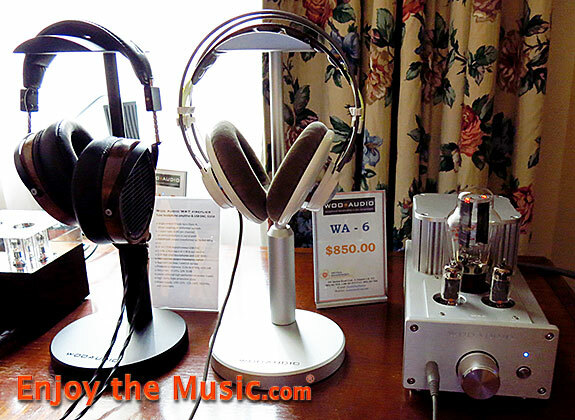 The tube guy within me was attracted to these Woo Audio rigs even though I'm not really into the head-fi thing. Nonetheless, I keep trying them out in case the GMO food that is forced upon us modifies my genetic makeup and alters my listening habits. 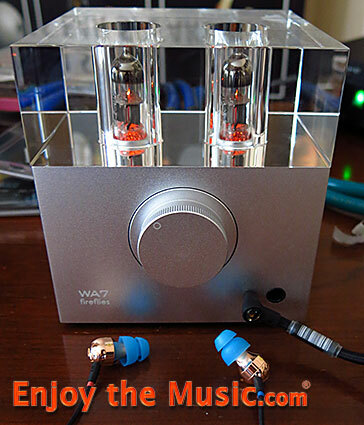 Seen here in silver is the Woo Audio WA22 ($2295) with 6080 power tubes, a fully balanced, Class A design with RCA and XLR inputs and a variety of balanced outputs for the headphones of your choice. 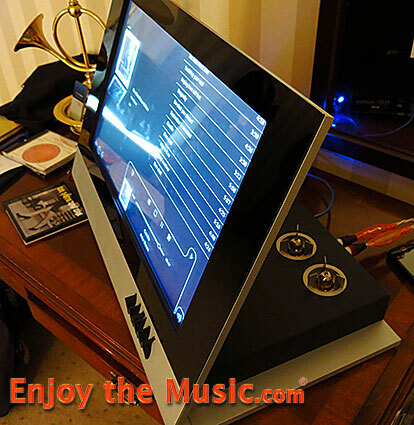 At 26 pounds, this is a serious amplifier that you will not likely drag off your desk. 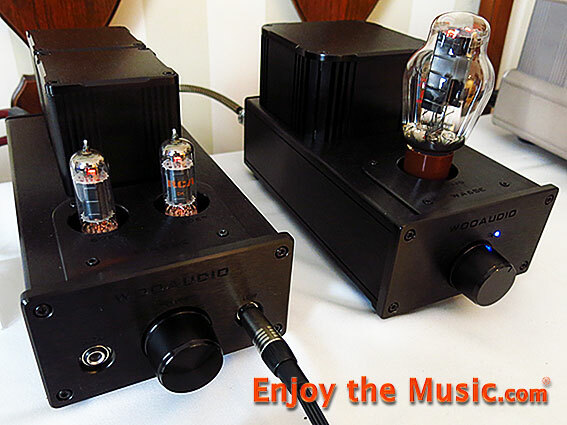 More modest was this two-chassis Woo WA6-SE triode design for $1370 in black with a separate power supply that I listened to with Audeze LCD 3 headphones. My favorite, along with a lot of other people, is the visually stunning Woo WA7 Fireflies headphone amp with built-in USB DAC at $1150. I listened to this amp with the new Cardas EM5813 Ear Speakers which sounded quite good to my novice earlobes. And for those who can't handle the New School (WA7), there is the WA6 at $850. The headphone stands from Woo, in both black and silver, were quite substantial and not prone to tipping over, reminding me of my father's heavy ham radio microphone stand. I had a nice chat with Andy Regan of Cardas who explained to me that George Cardas initially became interested in developing the earphones to help his father who was hard of hearing. This points out once again that it would be risky to pigeon-hole anyone in this industry as "just" a cable guy, or speaker guy, or amplifier guy. From listening to his new entry I'd say George has hit the ground running with this new earphone. While they are a bit heavy, the construction and finish make them a class act. Louis Desjardins was on hand with a prototype Kronos phono stage seen here in black in the middle of the HRS MXR stand in walnut burl finish. The phonostage, which may or may not go into production, was nestled between an Aesthetix Calypso line stage and an Aesthetix Atlas stereo power amp, both seen here in silver. 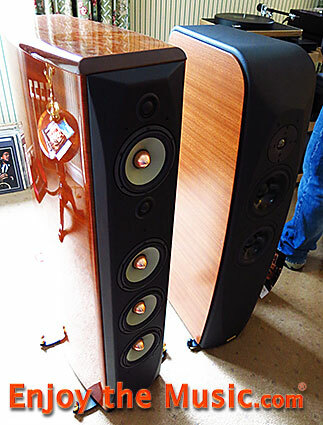 I'm not sure if these were the new Signature versions of the Aesthetix pieces, but Three Dog Night coming through the Acapella Ion TW 1 S speaker with its plasma ion tweeter sounded very good. The front end was the phenomenally well received Kronos turntable with counter rotating platters. Not surprisingly, the rig was set up on the diagonal of the room. In conversation with Louis he pulled up a diagram of the "Sparta" version of his turntable design that is projected to have about 85% of the sound quality of the "Athena" at about half the price. It may possibly be completed in time for CES, but there is no certainty to this. The Sparta is much more utilitarian in nature and appearance, targeting an entirely different customer than his flagship. Obviously, this was one of the more expensive systems at the show and the music was commensurate with the price. 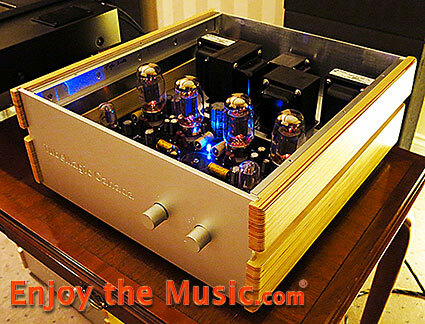 TubeMagic Canada was showing their IAM98 integrated amplifier ($3900) featuring KT88 tubes with some new capacitors this year. They ran it with the top off so visitors could see the quality construction and the massive transformers. The front end was a Chinese MHZS CD88H CD player with a tube in the analog output stage. It rested on the AOS acrylic platform that first piqued my interest years ago when I met the designer, Eddie Wong, who has since left the company he founded. The AOS uses an air and oil suspension system to damp vibrations and I continue to use one under my transport to this day. 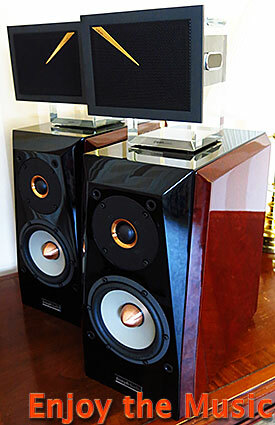 The speakers were the very fine sounding Reference 3A Episode BE ($6050). 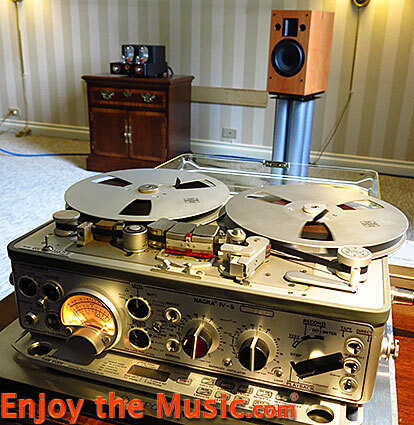 In fact, the rig had a very familiar sound since I still use TubeMagic monoblocks in my reference rig. This room was at a crossroad of the hallways and every time I passed there were people inside examining the gear. Moving on to the Plurison Zone on the 8th floor there was a cluster of rooms hosted by the Quebec distributor who is a recipient of the Life Time Achievement Award by the Festival Son Image. In 873 I found a room full of surprises. Previously, at the Montreal show I had seen the intriguing Rega RP-8 ($3195) but here it was actually playing � not any old LP, but Anne Bisson's Blue Mind, sounding very fine on a pair of Martin Logan Ethos speakers ($6995) which I had also seen, but not heard, before. Suddenly, in mid-song, a refrain came from the back of the room, sounding very close to the voice on the LP. I turned around to find Anne herself, singing along with the record. Amid the smiles and laughter I grabbed a hug and pledged once again to contact the people at the Rochester International Jazz Festival on her behalf. (They're really hard to reach.) 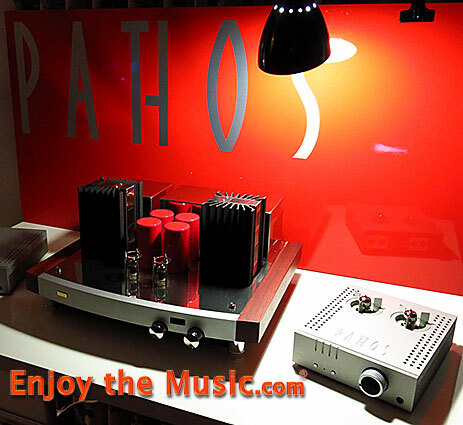 A Pathos In The Groove phonostage ($3295) was handling the low level phono signal and passing it on to the Pathos Ethos ($6995), a hybrid integrated amplifier with a tube preamp section and a dual mono solid state output stage delivering 100 wpc. Life imitating art imitating life. 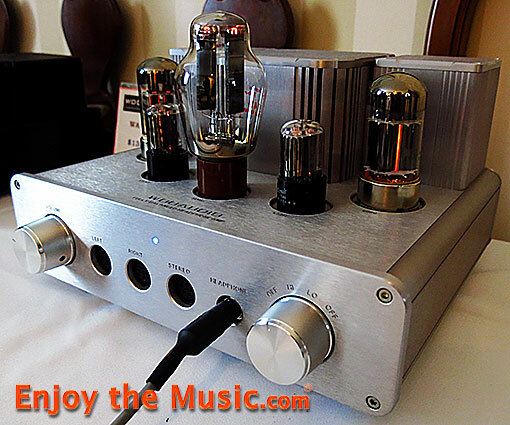 On silent display were two Pathos hybrid integrated amplifiers. The "Twin Towers" or TT ($8495) was a visual mixture wood, silver anodized aluminum, polished stainless steel, black heat sinks, red capacitors (?) and glass tubes that put out 35 watts per channel. And to its right was an equally well designed, though less visually complex Aurium ($1495) whose design I had raved about at the Montreal show earlier this year. And on another table was a hybrid lifestyle player of exceptionally fine design. Note the tubes in the box behind the screen.